How Much Should Parents Help Their College Student Financially? 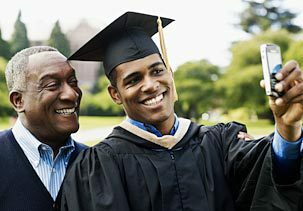 Home » How Much Should Parents Help Their College Student Financially? A challenging question that most parents will face as their kids are ending high school is – how much should they help their college student financially? It’s a tough question, because with the rising cost of tuition (and room and board, and textbooks, etc. ), the return on investment of education is starting to be pretty dismal. However, it is important for the student that parents don’t help too much financially, because college is as much a time of “textbook” education as it is about “life” education. How Much Parental Support is Too Much? So, how much parental support is too much? I think that parents who pay for everything for their student are doing them a disservice in the long run. I’ve seen it too many times – parents who want their children to focus on education, and so they will pay for everything, including giving their kids a stipend to spend while in school. While this may promote more textbook learning, it doesn’t teach the students to grow as people. Thinking about my college experience, having that kind of freedom would probably have made for more trouble that it’s worth – I would have partied hard and not learned as much at all. Plus, we’ve all seen it before – the college student that just ends up getting into trouble because everything is paid for? This of Van Wilder, the National Lampoon character who stayed in college for 7 years until his dad finally cut him off. However, after getting cut off, he learned more than he had in his past 7 years. Plus, the students will learn that they can’t take everything for granted. However, it can be hard for parents to cut the cord and let their students figure it out. The most important thing is that parents clearly communicate with their children what their plans are. So, if you only plan on paying for tuition, start telling that to your child before they apply to school. This could be a big factor in which schools they apply to. By setting the expectations early on, it will make the transition easier. The other option is to setup a staggered, almost stair-step, reduction in parent support. For example, start as a freshman with full support, cut out textbooks in year 2, drop the food expenses in year 3, and drop room and board in year 4. This will help your child get in a solid routine before you start eliminating help. Finally, there are a lot of ways that students can do it alone if their parents provide no support. Many schools offer a wide variety of scholarships and student loans that students can get for their education. However, with any loan or grant, you need to make sure that you fully understand what you’re getting into before signing up. With the diminishing returns on education, it could be a poor decision to take out a lot of student loans. Make sure you understand what you plan to do with your degree before investing in it. What do you think is reasonable for parents to provide for their child’s college education? I think it was alot easier back in the day for a parent to support their child for a college education…the rates now are just so rediculous…ontop of all the other things a parent has to save for now…401k, IRA, costs of everything have gone up…i think rather than funding the education it would be wise for hte parents to give some money to them to live while at college as you point out that…part of college is more than just the text book education…its about the life education…and if they had to work they might miss out on some of that life education…i had college for free as my father worked at one…but i still lived on campus as part of college is the experience…i hate paying hte loans now but it was part of the experience that i will forever remember..
My parents paid for half of my college, they paid for a very modest and reasonable room and board while I paid for tuition and books. It struck a good balance because I was motivated to do well and try to get scholarships while having assistance from my parents. I was very lucky. ^ this. I think paying for part of it helps motivate. No help de-moralizes and overwhelms, and a full ride entitles. I think it depends on the situation, but would definitely hesitate to provide full support. My parents were able to help a little but was mainly funded by myself along with loans. I feel that helped me learn how to work for something and also provided some hard learned life lessons. I think it really depends on the child, the school, and the means of the parents. If I knew my child was super-responsible I wouldn’t have qualms about keeping my level of support steady through their undergraduate years. My husband’s parents supported him 100% through college but I don’t think it stunted his growth. He was a very responsible student and graduated with highest honors on a double major (the only student in our year who doubled as it is incredibly difficult). He also became financially independent from them once he started grad school, 3 months after college graduation – so no lingering on. My parents paid for what they could and expected me to take out some student loans and work a bit and that worked out well for us, too. Honestly, after tuition and room and board is paid for, I had next to no expenses – just a small amount of groceries and a couple social outings per semester, quite easily covered by my work-study jobs. I’m not sure why students would have anything else because room and board would cover all necessary living expenses. But I, too, was a dedicated student and my parents knew I wouldn’t be wasting the money they were investing in my education.